Vetoquinol Dentahex Oral Rinse is highly palatable to dogs and cats. It supports healthy teeth and gums while keeping their teeth healthy and clean. Shake well before each use. Rinse daily following each meal or as directed by your veterinarian. Gently lift the upper lip to expose the teeth and gums. Point and squeeze to apply a gentle stream along the gum line. 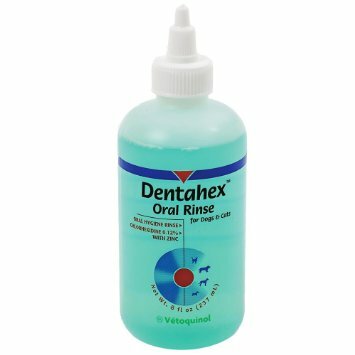 Dentahex Oral Rinse disperses rapidly and completely covers the entire oral cavity, even difficult to reach areas. Avoid touching the gum with the applicator tip to avoid any injury in case of movement of our pet. C.E.T.® 0.12% Chlorhex Rinse - 8 oz.